Domino Park is located on the site of the former Domino Sugar Factory in Brooklyn. A new waterfront recreational public space has opened in New York on a 4.5-ha (11-acre) site that once housed the Domino Sugar Factory. Owned by Brooklyn-based Two Trees Management, Domino Park gives the public access to the South Williamsburg Waterfront. The site includes many reclaimed materials from the former factory, including reused wood from flooring and cylindrical tanks. “The opening of Domino Park fulfills our promise to deliver this long walled-off ribbon of the Williamsburg waterfront to the residents of North Brooklyn—residents whose families worked at this factory for generations and who have contributed to the diversity and vibrance of one of New York’s most enchanting neighborhoods,” said Jed Walentas, Two Trees Principal. 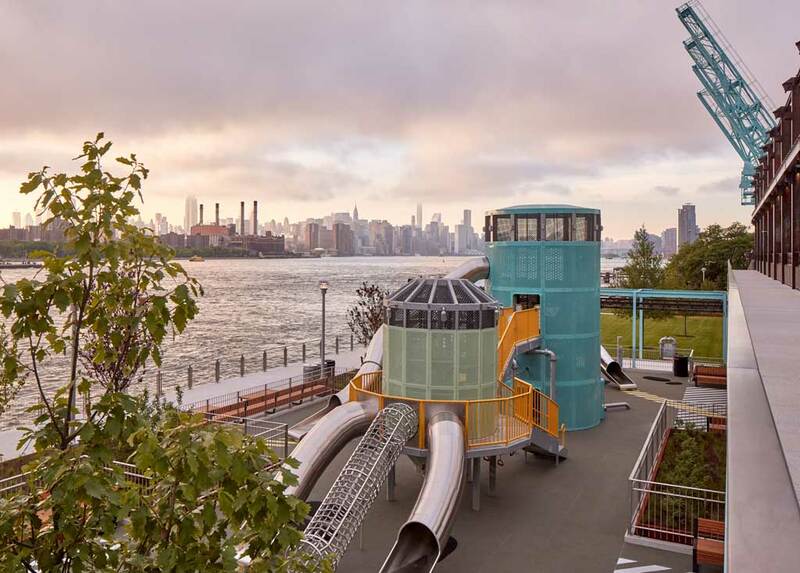 The park’s Sweetwater Playground pays homage to the Domino Sugar Factory and the history of the sugar industry. Conceived in partnership with landscape architecture firm James Corner Field Operations, the waterfront park reflects historic preservation, which is a guiding principle in Domino Sugar Factory’s overall redevelopment plan. Originally constructed in 1856, the factory was once among the largest sugar manufacturing companies in the world. With this history in mind, reclaimed and industrial artifacts are interspersed and incorporated throughout the site. Domino Park includes a five-block long Artifact Walk at the north end of the site, which integrates more than 30 largescale pieces of salvaged factory machinery along the waterfront, as well as 21 columns salvaged from the Raw Sugar Warehouse. Additionally, the Artifact Walk features approximately 178 m (585 ft) of crane tracks, which are incorporated into the design of the park, as well as four 10.9-m (36-ft) tall cylindrical tanks that collected syrup during the refining process, mooring bollards, bucket elevators, and various dials and meters from the factory with original signage. You May Also Like Top 10 states for LEED: Who made the list? 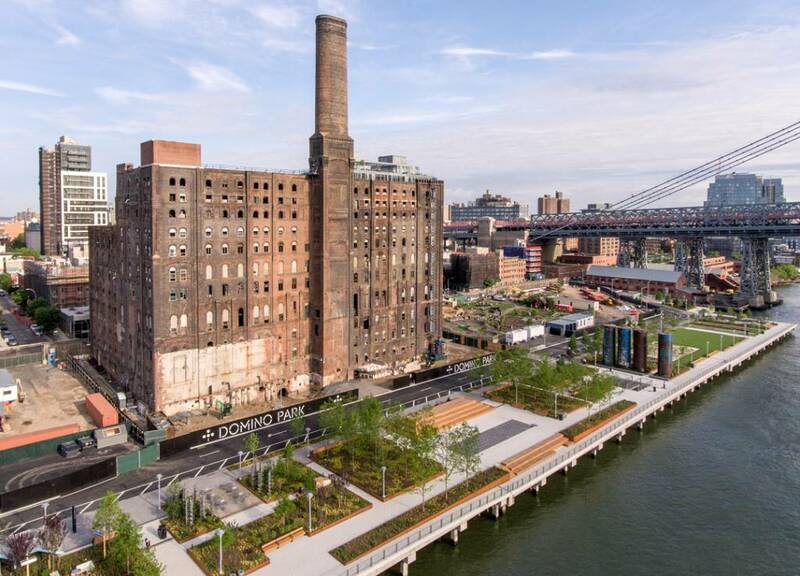 The park is part the Domino Sugar Factory Redevelopment Plan, designed by master planners SHoP Architects. In addition to Domino Park, the design features mixed-use residential buildings and an adaptive reuse plan to convert the Domino Refinery facility into technology and creative industry offices. The site’s Sweetwater Playground also pays homage to the Domino Sugar Factory and the history of the sugar industry. The play structure features three primary structures—an elevated cabin, towering silo, and an industrial container—along with stainless steel slides, climbers, and catwalks reminiscent of the original factory’s architecture and infrastructure. 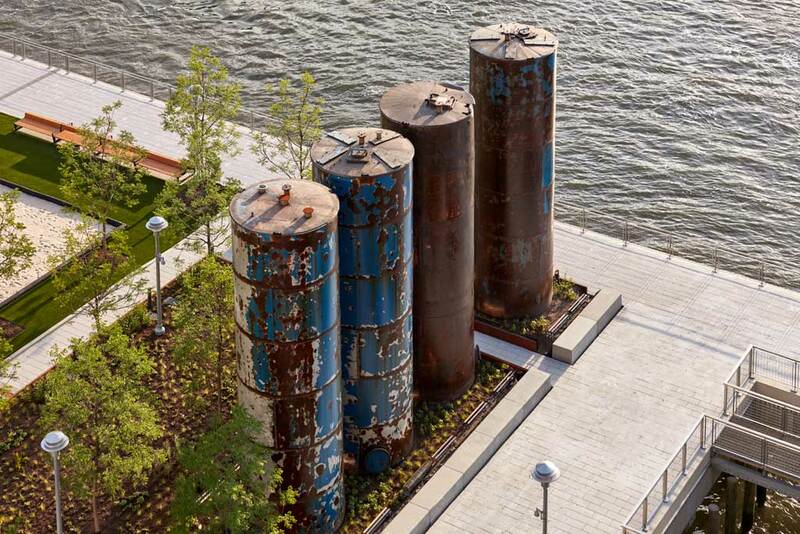 Domino Park’s Artifact Walk integrates largescale pieces salvaged from the former factory, including cylindrical tanks. “Domino Park will hopefully serve as a living, breathing tribute to thousands of Domino workers, their families, and the rich tapestry of history that defines this New York community,” said Walentas. The site incorporates a resilient design approach, which includes raising the platform 0.6 to 2.1 m (2 to 7 ft) above Federal Emergency Management Agency (FEMA) flood regulations, ensuring the location will be protected from flooding. Additionally, Domino Park includes a sustainable plant palette contributing to coastal resilience including a mix of nearly 175 trees. One component of the development, 325 Kent Avenue, was recently honored with a 2018 North American Copper in Architecture (NACIA) award from the Copper Development Association (CDA) and the Canadian Copper & Brass Development Association (CCBDA). To read more about the winners, click here.